Fujifilm has been producing lenses for decades now. The are m42 screw-mount lenses to be found, medium-format lenses on their fixed-lens 120/220 film rangefinder cameras, not to mention broadcast and cinema lenses. In this article, we will focus on Fujifilm’s current digital compact camera system with APS-C sized sensors and discuss the most common Fujifilm lens abbreviations you can come across while looking for a new lens to put on a Fujifilm X-E1 or other camera. I will also mention some of the common abbreviations found on other Fujinon lenses, too. Fujifilm X-mount – this is the current, modern, fully-electronic lens mount used in Fujifilm’s mirrorless camera system with APS-C sized sensors. As of October 2013, there are five cameras that use this lens mount: X-Pro1, X-E2, X-E1, X-M1 and X-A1. Fujifilm X-mount has a flange focal distance (distance between lens mount and film/sensor plane) of 17.7mm. It is relatively new, but has gained some good traction with over 10 lenses currently available since its launch in 2012 and more to come soon. Lenses that use this bayonet are simply called Fujinon. Fujica X-mount – an old, mechanical lens mount used in the film era. It replaced the previous m42 screw-mount and was used by STX-1 and other analogue 35mm format Fujifilm SLR cameras. Fujica X-mount lenses are called X-Fujinon and X-Fujinar. The mount – and lenses designed for it – are now obsolete, but there are still plenty of old X-Fujinon lenses to be found in places like ebay at bargain prices. The Fujica X-mount has a flange focal distance of 43.5mm. What is so important is that both these mounts and lenses that go with it are similarly named and can be easily confused. Do not be mistaken – all current Fujinon lenses for the mirrorless camera system are fully electronic and have autofocus along with other features. If you’ve come upon a Fujinon X-mount lens that is obviously old and fully-mechanical, it is designed for old Fujica film SLR cameras and can only be mounted on a digital Fujifilm mirrorless camera through the use of an appropriate mount adapter. XC – one of the two classes among current Fujinon lenses for Fujifilm digital mirrorless cameras is the XC. Fujinon XC lenses are generally cheaper and simpler than their XF siblings and made mostly out of plastic (with metal bayonet). To quote Fujifilm, they are designed to be “compact and casual”. Of the two current XC lenses in Fujifilm’s line-up, neither one has an aperture ring as a cost-saving mean. XC lenses should not be considered below-par, however. They are first of all are made to be compact, lightweight and affordable – that is their biggest advantage. XF – these lenses generally have metal barrels and wider-than-average apertures. For example, the first XF zoom lens, the Fujinon XF 18-55mm R LM OIS, has the aperture range of f/2.8-4, which is considerably faster than the rivals. It is also quite expensive. XF lenses are the high-performers of the X-mount Fujinon lens line-up. Fujifilm is putting all of its best technology into XF lenses for highest-possible image quality. Most of them feature ED and aspherical glass elements for better chromatic aberration control, as well as aperture rings. Such a ring was omitted from the XF 27mm f/2.8, because in the case of this pancake lens compact dimensions were a priority. R – this designation means that a given Fujinon X-mount lens has a dedicated aperture ring. It does not allow direct aperture control – it is not coupled to it by gearing, but is instead electronic. By turning the ring you do not physically stop down or open up the aperture as you would with a legacy manual-focus lens, but instead tell the camera to change the setting as you would with a simple control dial. The aperture can be changed in 1/3 stop increments. LM – Linear Motor used for lens element movement during autofocus and manual focus operation with Fujinon X-mount lenses. It is not a ring-type ultrasonic autofocus motor and thus different from Canon’s USM and Nikon’s SWM technology, but still provides quiet operation and good speed. Lenses that do not have LM motor use a regular coreless DC motor for autofocusing. OIS – Optical Image Stabilization is Fujifilm’s alternative to Nikon VR and Canon IS systems. It is designed to move some of the lens’ optical elements to counter shake and provide sharper results when slow shutter speed is used for static subject capture. Fujifilm claims an approximate hand-holdability improvement up to around 4-4.5 stops, which is on-par with competition. In the field, expect the result to be somewhat less impressive, but still very useful. The first lens to incorporate Fujifilm’s OIS is the Fujinon XF 18-55mm f/2.8-4 R LM OIS. OIS uses a similar sort of Linear Motor that is also used for autofocusing. EBC – Electron Beam Coating is used to minimize flare and ghosting produced by the lens by increasing the light transmittance so that more light passes through the glass towards the sensor, and less of it gets reflected. It also increases contrast and is basically similar to multi-layer coatings developed by other lens manufacturers in its function. Fujifilm lenses that use Electron Beam Coating will have EBC or Super EBC designation, with the latter being the improved versions of the basic EBC. Fujifilm broadcast lenses use HT-EBC coating (High Transmittance Electron Beam Coating). ALG – All-Group Focusing means all the lens’ optical elements are moved during focusing operation. This maximizes optical performance throughout the focus range. Current Fujinon X-mount lens line-up only has one specialized lens class. Hopefully, tilt-shift lenses are soon to come. Macro – Fujinon macro lenses, just like any macro lens on the market, are designed to provide good magnification with a relatively short minimum focus distance. As of October 2013, there is only one Fujinon Macro lens for the Fujifilm X-mount cameras – the Fujinon XF 60mm f/2.4 R LM lens. Unlike most modern macro lenses, however, the XF 60mm f/2.4 R can achieve a relatively modest magnification of 1:2, so Fujifilm’s definition of “macro” is a little bit more forgiving than that of most other manufacturers (Canon and Nikon macro lenses are generally capable of 1:1 magnification). F – the letter F in the lens name means it is a fisheye lens. SW – the letters SW in the lens name mean it is a super-wide angle lens. W – the letter W in the lens name means it is a wide angle lens. Z – the letter Z in the lens name mean it is a zoom lens. T – the letter T in the lens name means it is a telephoto lens. M – the letter M in the lens name means it is a macro lens. DM – the lens allows automatic aperture control (Dial Mode). Such lenses can be used in Program, Shutter-priority, Aperture-priority and Manual exposure modes by cameras that support them. Non-DM lenses can only be used Aperture-priority and Manual modes. Time to analyze the name of an actual lens. 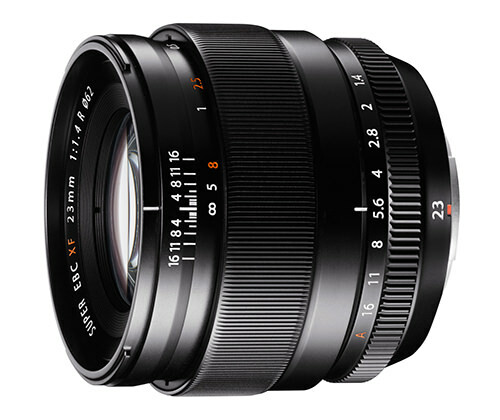 How about the new Fujinon XF 23mm f/1.4 R? Here is the full lens name that can be found looking around the front glass element: Super EBC XF 23mm 1:1.4 R Ø62 Fujinon Aspherical Lens. If we break it down, we find out that the lens uses special multi-layer coating to reduce flare and increase contrast (Super EBC). It is also a high-end Fujifilm X-mount lens designed for Fuji’s compact camera system and promises great optical performance, wide aperture and build quality with metal casing (XF). The maximum f/1.4 aperture of this fixed focal length lens can be controlled with the help of aperture ring (R). Autofocus is run by a high-torque coreless DC motor (lack of LM designation). The lens takes 62mm filters (Ø62) and uses an Aspherical glass element in its optical formula. What do you mean discontinued? It’s not available yet, you can only pre-order it. I am sorry, I do not quite understand what are you talking about exactly. Did I say something was discontinued? Yes, although I commented from the wrong post. When you click through from this post to the one describing the new 23mm f/1.4 across from “production” you have discontinued. Oh, I see. Our lens database still has some errors as there are so many lenses. We are working on it. :) Thank you! Wow that was fast you already fixed it! what is the difference of EBC and nono-GI???? Weather Resistant. I.e., resistant to dust and rain. Yeah R is Aperture Ring and W is weather Sealed, where did the W= Wide angle come from? the abbreviations you are referring to concern legacy (old) fujinon lenses, not the new ones designed for digital cameras, as discerned in the article.